Of the forty-plus African American newspapers published before the Civil War, we will focus on one newspaper for one year as a microcosm of the antebellum black voice in print. Published in New York City, the Colored American was adapted from the earlier Weekly Advocate by Charles Ray and Samuel Cornish, both black clergymen and abolition activists. From the first issue in March 1837 to the first-anniversary issue in 1838, we read a selection of articles and editorials. The wide-ranging topics reflect the unified goals of abolition and civil rights as well as the disagreements among free African Americans over political agendas, modes of self-improvement, co-activism with white people, farming as an option for freed slaves, emigration to Africa and the Caribbean, ways to help slaves in the south and fugitive arrivals in the north, proper education and decorum of young people, and even the appropriate name for black Americans (see "Title of This Journal" above). How did the Colored American strive to promote a "unity of feeling and effort" among free blacks? What model of social and political identity was offered to black readers of the Colored American? What range of tone and attitude do the editors take in their opinion pieces? When do they praise and chastise their readership? How do they address those who disagree with them? What topics and opinions in these selections did you find surprising or unexpected? Why? To what extent do the editors address white people, directly or indirectly? What is their message? How do you think white people responded to the Colored American and other black newspapers? Compare the editorials in the first issue ("Why We Should Have a Pape") with those at the beginning of its second year ("Our Second Year" and "The Importance of Our Paper"). Over the year, when are the editors encouraged? discouraged? How do they try to influence their readers' opinions and behavior? How might the Colored American have differed if it had been founded in the 1850s after the Fugitive Slave Act of 1850? Compare the Colored American with postbellum African American periodicals (see The Making of African American Identity, Vol. II (e.g., Cleveland Journal) and Vol. III (e.g., Opportunity and Chicago Defender). 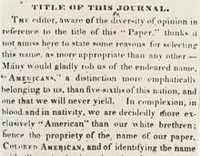 Image: "Title of This Journal," Colored American, 4 March 1837, digital image (detail) from Black Abolitionist Archive, University of Detroit, Mercy. Permission pending.